Written with the expert assistance of Deborah J. Leslie. 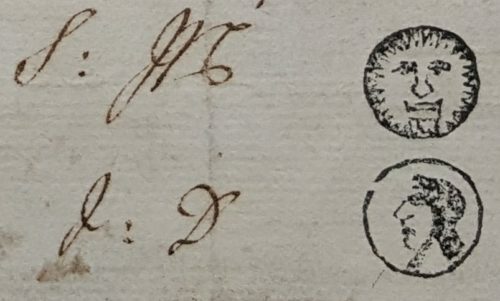 It is probably pretty obvious to Collation readers by now that Folger staff and researchers have a strange obsession with printed blank forms: see “Sign Here Please“, “Bound to Serve,” and “Print or Manuscript” for previous posts on the topic. Printed blank forms perfectly exemplify the hybrid nature of many textual artifacts from this period, requiring consideration of both the printed and manuscript evidence in order to be fully understood. Burial in wool affidavit for John Winne, Merchant, of the parish of St. Augustine, Bristol, June 23, 1736 (Folger MS Y.d.1794). 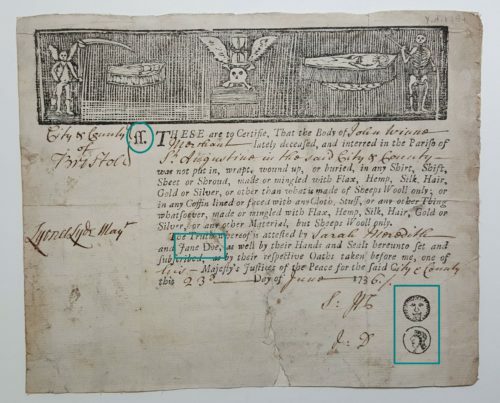 Burial in wool affidavit for Linsey Winne of the parish of St. Augustine, Bristol, June 10, 1729 (Folger MS Y.d.1793). 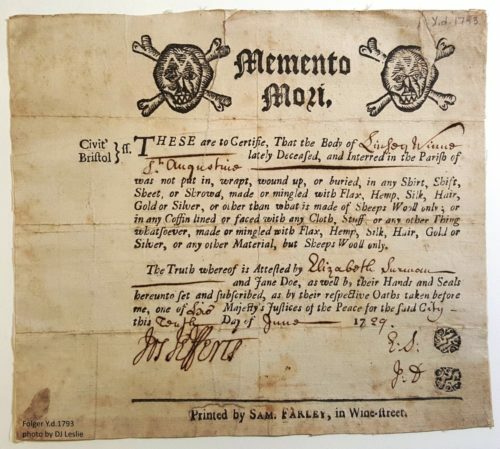 In June 2015 we acquired two “affidavits of burial in woolen” from the bookseller Samuel Gedge. Affidavits like these came about after a 1678 “Act for burying in Woollen” (which repealed a similar 1666 act) declared that all dead people must be buried in wool rather than any other type of cloth, as a way to keep both the wool and paper manufacturing industries alive and well in Great Britain (less linen disappearing underground meant more rags with which to make paper). The act required that a justice of the peace certify that the corpse was wrapped in wool in preparation for burial. This affidavit was to be signed and sealed by two witnesses, often the female “searchers” who had prepared the body. It then had to be delivered to the parish minister within eight days of burial, or else the family was required to pay a 5 pound penalty, with half of the money going to the parish poor and the other half to the informer. Receipt of the affidavit was noted in a parish register. In preparation for Acquisitions Night on March 7, 2018, Deborah Leslie created Hamnet records for them according to DCRM(B) standards, the standards for cataloging rare printed books. We could have been done then and there. But when I pulled them from the vault in order to confirm the accuracy of the short Acquisition Night description, I was delighted to encounter a few unfamiliar features that seemed worthy of exploration. Deborah willingly leapt into the rabbit hole of print/manuscript ephemera with me. SS? Jane Doe? Fake seals? Folger MS Y.d.1794. Deborah sorted out the “ss.” (found in the upper left part of the printed text) pretty quickly, concluding that it likely stands for scilicet, which means “namely” or “in particular” and is used to specify the city within the county in which a document is notarized, according to the American Society of Notaries. Garner’s Dictionary of Legal Usage (Oxford, 2011) also suggests scilicet might be the expansion, but still treats it as a “A Mysterious Legal Abbreviation“. What about Jane Doe, who appears as a pre-printed name in both affidavits? Is it possible that there was an actual Jane Doe who was always one of the witnesses for burial in wool affidavits over a period of at least 7 years? Or was she a legal fiction, the secondary witness who was more of a formality at this point? Jane Doe is one of the two women who testifies that Linsey and John Winne were buried in wool in 1729 and 1736. Her name is pre-printed while the other names are supplied in manuscript. 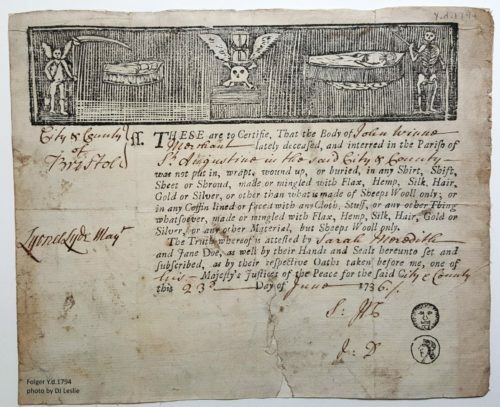 I reached out to the guest author of a recent Collation post on bills of mortality, who is also one of the co-organizers of an upcoming symposium on the subject at the Folger, to see if she and her colleagues could help. Kristin Heitman, Vanessa Harding, Wanda Henry, and Richelle Munkhoff pointed to two very useful articles: Steven Tomlinson, “Burials in Woollen in Oxfordshire,” Oxfordshire Local History, I:3 (1981): 2-10 and William Kellaway, “Burial in Woollen,” Transactions of the London and Middlesex Archaeological Society 18 (1955): 38-47. However, none of them had encountered a Jane Doe among the women searchers and sextons of the period. At the bottom of each of the affidavits, Jane Doe provides her initials, next to what seems to be a pre-printed seal. Curiously, a 1709 affidavit at Bristol Museums has the same pre-printed seals as Folger MS Y.d.1794. While I’m referring to them as pre-printed, they could have been stamped on at the time the affidavits were initialed (I haven’t looked at them under magnification yet). 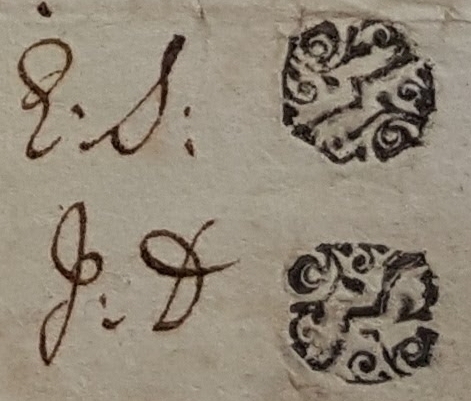 Jane Doe’s initials next to pre-printed seals (details from Folger MS Yd.1794 (top) and Y.d.1793 (bottom)). The Oxford English Dictionary describes “Jane Doe” as “a female party whose identity is unknown or deliberately withheld, or (in later use, more generally) to denote an ordinary or typical female; (also) an anonymous woman or girl, a person identified as ‘Jane Doe’.” In these two Bristol affidavits, it seems that Jane Doe might be not only anonymous but non-existent, a name on a form that correlates to nobody, one of the many legal fictions deployed in the name of bureaucratic compliance, a “cultural trace” (as Richelle suggested to me in an e-mail) of an earlier practice. Deborah’s not-written-in-stone solution was to describe her as “Doe, Jane, active 18th century” with the relationship designator “associated name,” and to note that “Jane Doe’s identity as a real person has not been confirmed.” The finished catalog records are here and here. Please let us know if we are wrong or you have further suggestions or insights about Jane Doe! A New Acquisition: from the workshop of the Naval Binder? By coincidence, this afternoon I recorded a copy of the 1678 Act for Burying in Woollen in the Archives at Canterbury Cathedral (CCA-U3-89/28/3). The Act was of course included in the Statutes of the Realm but copies of that section of the Statutes were issued separately with a title page (paginated , 87-95,  p.) and presumably distributed to town and ecclesiastical authorities for enforcement of the provisions of the Act. The Canterbury Cathedral copy was deposited by the local parish of St Mildred’s. A search on the ESTC database shows only two recorded copies of this separate issue (http://estc.bl.uk/R236432; British Library and University of Virginia), though there are probably more lurking in local archives. The Canterbury copy will be reported to ESTC next week. Aren’t the Anno Regni’s fun? I recently finished cataloging a sammelband of 1661-1662 acts (E1245.5 1661-62). It contains the two sessions of 13 Car.II issued in the aggregate, followed by the 33 acts of 14 Car.II issued separately as singles, or in groups of twos or threes for closely related acts. Now that it’s done, the volume seems rational enough. Getting to that point took this cataloger a ridiculously long time. In manorial Court records, the fictional names John Doe and Richard Roe commonly occur. They fail to appear to testify in opposition to legal claims and thereby the claimant secures an inheritance in manorial leasehold. In my comment I should have written ‘copyhold’ rather than ‘leasehold’ which is not the technical term in the manorial system.